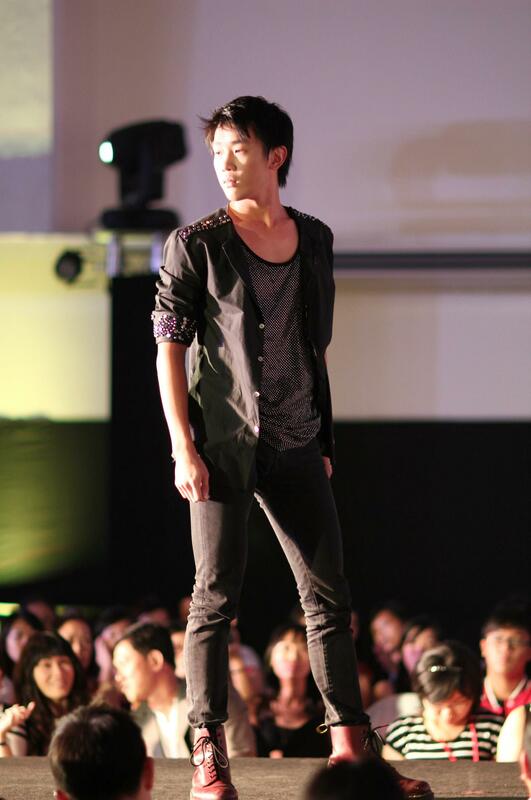 As the Raffles concert season draws to an end, 2012 has seen its fair share of amazing performances, but none so far has had the glitz and glamour of Raffles Runway’s annual fashion show, R Project 2012. Themed ‘Memento Mori: Remember your Mortality’, the show was set to impress with showcases of designs inspired by apocalyptic sub-themes ‘Animalism’, ‘Annihilation’ and ‘Awakening’. The Gala Night held on Saturday 12 May was entirely sold out, and with good reason: audiences were treated to a night of captivating designs by both external and student designers and for the very first time, a batch collection by the graduating Year 6 designers from Raffles Runway. 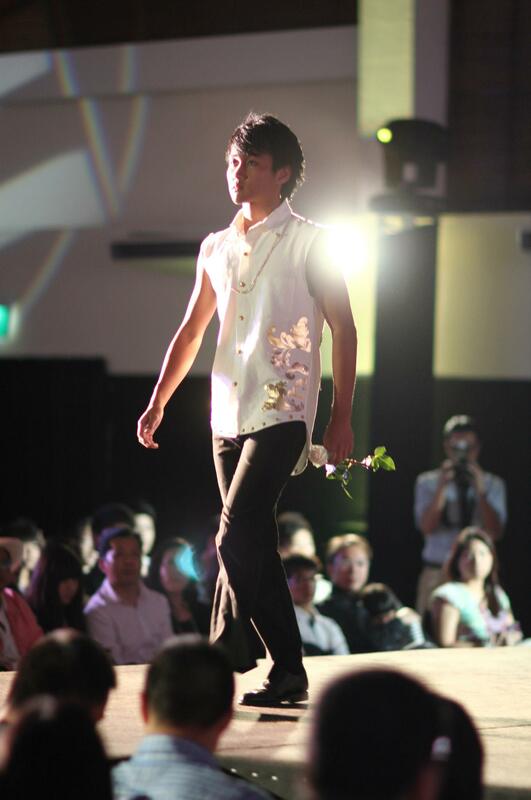 The designs were modelled by student models who displayed remarkable allure and poise. Starting the show with a razzle-dazzle display of the summer collection by French Connection (and a nod to R Project’s sponsors), the models took to the runway in chic dresses for the ladies and suave ensembles for the men. The designs were charming and vivacious, perfectly suited to the trendy young adults who made up most of the audience. But it was clear that the student designs were what everyone was really looking forward to; see the slideshow for a quick glance at the pieces and read our commentary below. This highly anticipated segment of the show soon commenced with a pageant of student designs with the theme ‘Animalism’. Furs, feathers and animal prints were the order of the day. 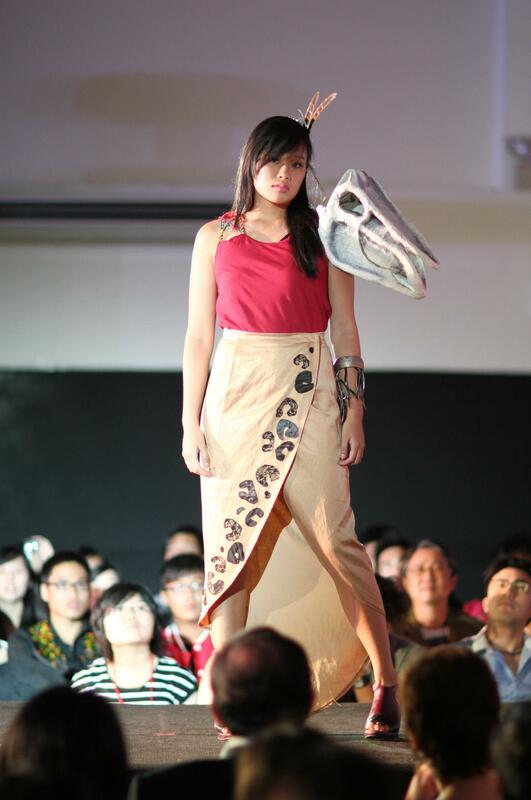 Among the notable pieces were Aileen Pua’s dinosaur-inspired dress, eye-catching for the horse skull attached to model Cheryl Goh’s shoulder, Jasmine Ang’s peacock feathered-maxi dress and shirt, modelled by Goh Li Ting and Jovi Ang, and Trang Cat Tuong’s simple black cocktail dress with a skirt made entirely of black feathers. The next collection of designs centred on the theme ‘Annihilation’. Designs with this theme were less flamboyant than that of the previous one, but were edgy and aptly conveyed ideas of devastation and destruction. 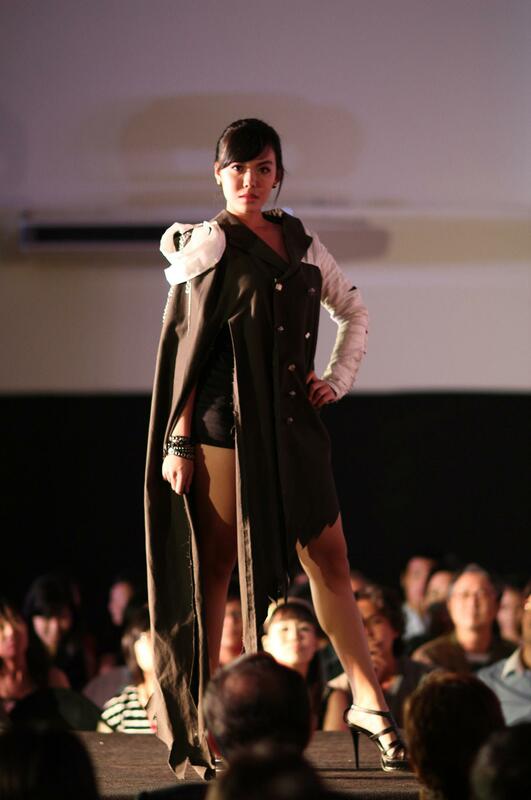 Models showcased costumes of chains and leather, sequins and stones. Memorable pieces were those of Neo Wen Xin’s, where Sulin Quak flaunted a dress with a ruby red skirt and lace top with a matching mask; Dyon Ang’s, a black jacket embellished with crystals with a top modelled by Eugene Tan; and Jeanine Cheok’s, whose design was reminiscent of ancient Greek warriors for the male model Shakthi and befitting a Greek goddess for the female model Tian Yuming. The show was temporarily disrupted by a technical error when the music stopped without warning. A second-rate model would have stumbled or been distracted, but Julia Lim, modelling a military-inspired piece designed by Zhang Kai Wen, displayed true poise. She swept across the runway without so much as a pause and even smiled at the audience, earning a well-deserved round of applause for her grace and composure. 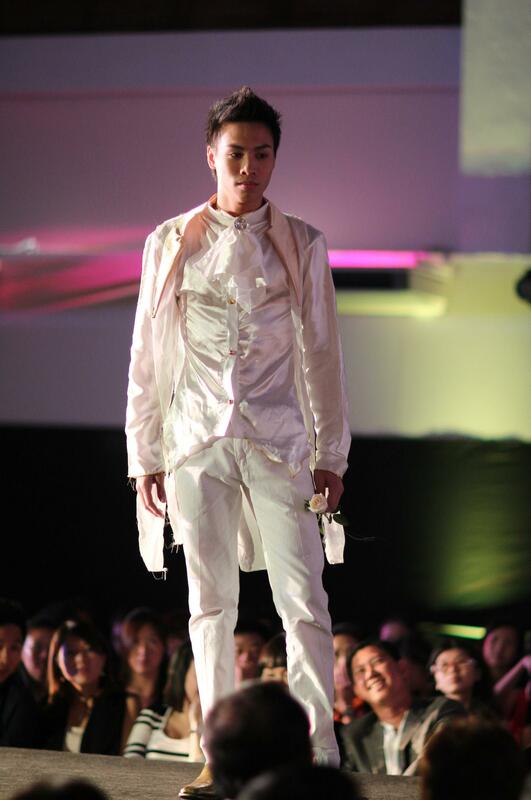 Ending the show on a strong note was the batch collection from the graduating Year Six designers, themed ‘Awakening’. The colour white dominated the designs, intending to convey purity and hope after the destructive ‘Annihilation’. Beautiful designs were modelled with pride, with each model carrying a white rose, which symbolised innocence, purity and new beginnings. Noteworthy pieces were Jolynn Lim’s lace and satin dress modelled by Baik Gi Won, Angela Ang’s gold-tinged evening gown modelled by Tian Yuming and Dyon Ang’s leather minidress, studded with mirror shards, on Tang Liyong. Handsome pieces for the men included Zhang Xue’s gold-patterned shirt modelled by Ryan Lee and Tan Yan Ling’s formal wear-inspired shirt, which Jovi Ang wore. The night was also graced by a performance by Modern Dance, maintaining the suspense while local fashion gurus Mr Wykidd Song, Ms Sharon Lim, Ms Tjin Lee and Mr Jumius Wong decided on two winners who would head to Milan for a highly-coveted internship at major fashion house Versace. 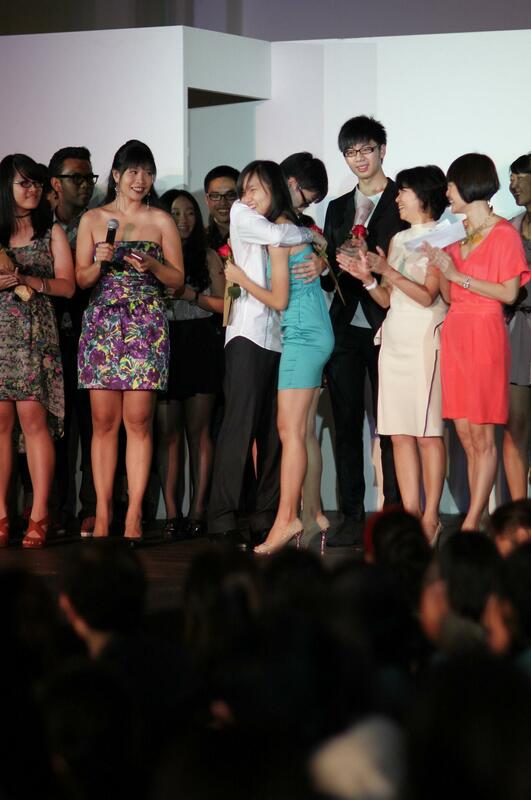 Finally, guest of honour Ms Janice Koh came on stage to announce the winners. Full of praise for all the designers and models, she announced that she felt as if she had been “transported to a little part of Milan” during the show, which had showcased designs with a “high level of creativity”. R Project 2012 was a definite success, described by Mrs Lim Lai Cheng as the “most sophisticated” show out of the five she has attended. R Project 2012 would no doubt have been impossible without the executive committee and the graduating batch of Raffles Runway labouring behind the scenes for a good eight to nine months. When asked for her least favourite part of R Project, Raffles Runway chairperson Jolynn Lim was quick to respond: “being super stressed, juggling schoolwork, expectations because of the extensive publicity, negotiations with external sponsors and everything”. However, her dedication to the show, her CCA, and fashion was clear when she said: “But every single thing counted. That was what made R Project what it was today. I would do it all over again.” This sentiment was echoed by exco member Jasmine Ang, who said she felt a great sense of fulfillment after the event, and would definitely miss it. 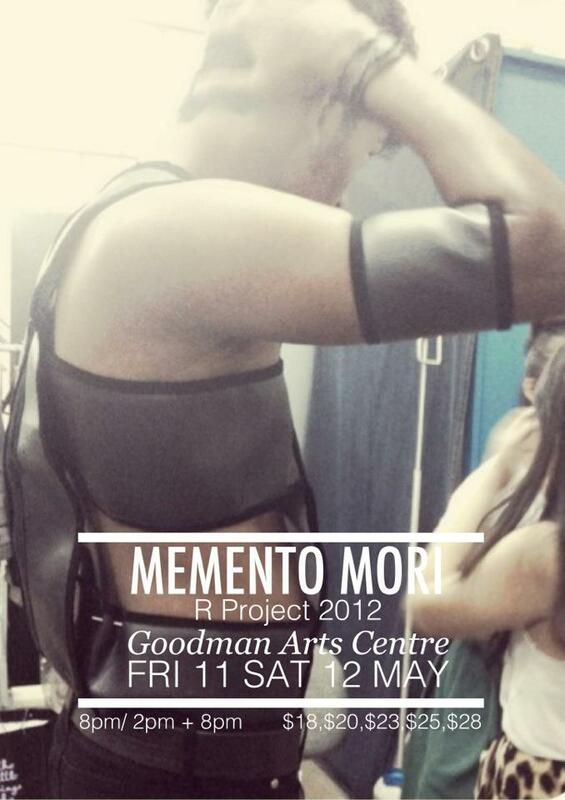 With Memento Mori blowing everyone away with the wealth of beautiful designs and the professionalism of the models, the Raffles Runway batch of 2012 has certainly set a high standard for their juniors. But with their guidance and a pool of talent and potential among the Year Fives, the next Runway project is set to be another resounding success. For more photos, check out the albums by various photographers at the Facebook event page. You can also watch the behind-the-scenes video of R Project 2012 here! Dame Lim Lai Cheng? Not quite – but a Chevalier nonetheless.